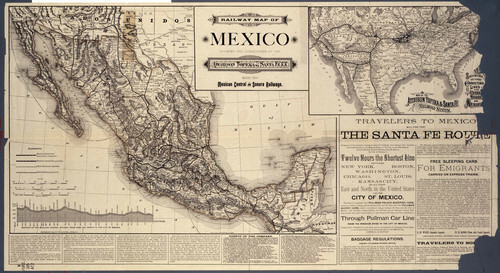 This map shows the lines of the Mexican Central and Sonora Railways completed and projected. It also shows other railways completed and projected. An inset shows the lines of the Atchison, Topeka and Santa Fe Rail Road in the United States and their connection to the Mexican railways. There is text which advertises the Atchison, Topeka and Santa Fe Railroad. This text also discusses some of the customs procedures and relations between our two countries.